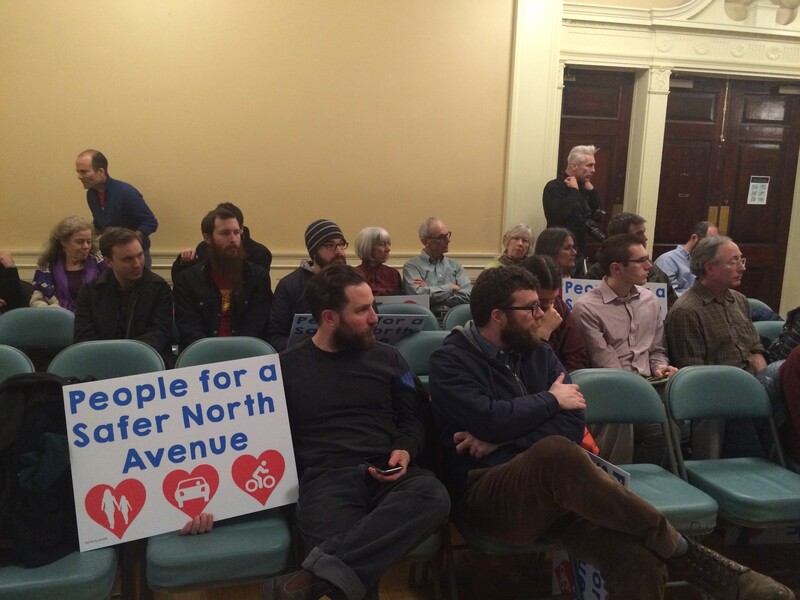 Supporters of the North Avenue pilot project made up most of the audience at Monday's city council meeting. They weren't happy about it, but Burlington city councilors voted 9-3 Monday night to put a question about North Avenue on the Town Meeting Day ballot. In the same breath, many of them pledged to put personal resources into defeating the measure, which asks voters whether they want one section of the road to remain four lanes. Council members found themselves in this conflicted position after the city attorney determined that the phrasing of a citizen-led petition to get a similar question on the ballot didn't pass legal muster. The group of New North End residents who led the petition effort are hoping that a strong vote in support of four traffic lanes will dissuade the city from pursuing a pilot project that would reduce that section from four to three traffic lanes and add two bike lanes. The question is advisory, meaning the city isn't obligated to abide by the voting results. Cyclists showed up in full force Monday night, with war stories about getting hit by cars and harassed by motorists while commuting on North Avenue. They urged councilors to ditch the ballot question, which, they suggested, could let public opinion dictate a safety issue. Jason Van Driesche, advocacy and education director at Local Motion, characterized the petition effort as the "opening salvo from a small but determined group" that wants to derail the pilot project and keep "a dangerous street frozen in time." Noting that there has already been an "intense public process," Andrea Todd, a member of the North Avenue Task Force, argued that bringing the pilot back up for debate would "disrespect the work that's happened on the Task Force." One of the petitioners, Tony Bell, who told the council he's lived in the New North End for more than 40 years, said he and others "pounded the pavement in all kinds of weather to try to stop what we see as poor decision-making by local government." "I cannot believe an issue like this has torn our neighborhood apart," said city Councilor Dave Hartnett, who represents the New North End. As the debate dragged on Monday night, it also led to testy exchanges among the councilors themselves. Hartnett chided his fellow New North End Councilor Tom Ayres for criticizing the petitioners. Ayres earlier described them as "strident advocates" who displayed a "Sarah Palin-like mixture of anger, misrepresentation of the facts and an utter lack of clarity." Kurt Wright, the third New North End councilor, who helped gather signatures for the petition, also scolded Ayres and criticized Local Motion's advocacy on the issue.